Hesychius' 5th(? 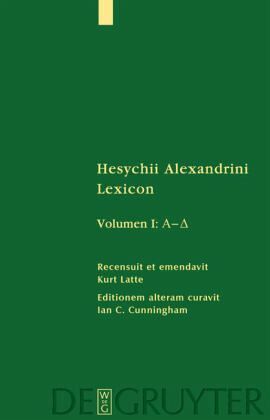 )-century Greek lexicon is a very important survivor of ancient learning, including fragments of Greek literature and offering material, not yet fully evaluated, on patristic writings. The final critical edition was begun by Kurt Latte (Vol. 1, 1953 and Vol. 2, 1966, Copenhagen: Munksgaard; now out of print) and continued by Hansen and Cunningham (SGLG 11/3 and 11/4, 2005 and 2010). This revised edition of vol. 1 provides a more complete record of the readings of the unique manuscript, cites parallels from related works in the current editions, and takes account of the scholarship of the intervening years. A revised edition of the second Latte volume (SGLG 11/2, 2019) followed this edition. A volume of indexes and addenda is planned (to be SGLG 11/5).